In continuous production manufacturing, making sure processes run consistently and safely are major concerns. In the petrochemical, cement and glass industries, Elmelin provides essential support for continuous process with specialised high temperature insulation solutions. 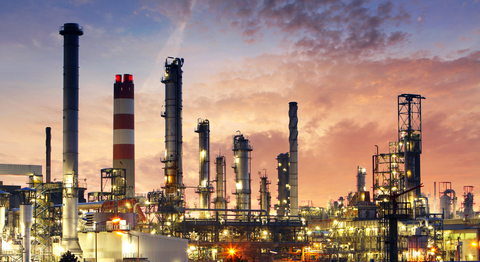 Elmelin’s high temperature insulation solutions help the petrochemical industry reduce its energy consumption, emissions, and operating costs, while supporting the continual improvement of its processes. This industry typically operates in extremes, having to ensure consistency of production and safe processes in harsh environments. Insulation is an installation necessity for protecting and enabling flow while keeping operations safe at all times. Elmelin’s microporous based insulation products are lightweight but with superior strength, with exceptional resistance to high temperatures and mechanical stress. Our product range is adaptable to your needs, with the manufacturing capability to tailor our insulation solutions to your specific requirements. Industrial furnaces or kilns used in the continuous processing of cement and glass will consume large amounts of energy. How these perform affects the balance sheets of the businesses using them, and the quality of the products they produce. Performance and optimisation are, therefore, key factors in any continuous process. Elmelin’s aim in providing insulation solutions is to help our customers maintain consistency, while improving their productivity. We help with process improvement by helping expand the capability of industrial ovens through better control of heat. Another vital application for supporting continuous process industries is valve insulation. Control valves are essential in the safe construction of high temperature processes for furnaces. Because these valves act as a safety system, it is vital that they are sufficiently insulated themselves against intense heat. Again, Elmtherm’s advanced insulation qualities make it a superior material for valve applications. If you want consistency in heat regulation through high performance thermal barriers, contact us. We can offer you practical insulation solutions to ensure your production is cost effective and efficient.